I moved to San Francisco six months ago and my umbrella hasn’t left its dusty sleeve yet. Scientists and politicians, everyone agrees. California is in deep trouble. We enter the fourth year of drought and the soil has never been drier. Some look at the sky with hope that El Niño will bring much needed rain. But most are starting to wonder if this is just the beginning. Are we entering a mega-drought that could last for more than a decade? Agriculture, one of California’s strongest pillars has taken the biggest hit. 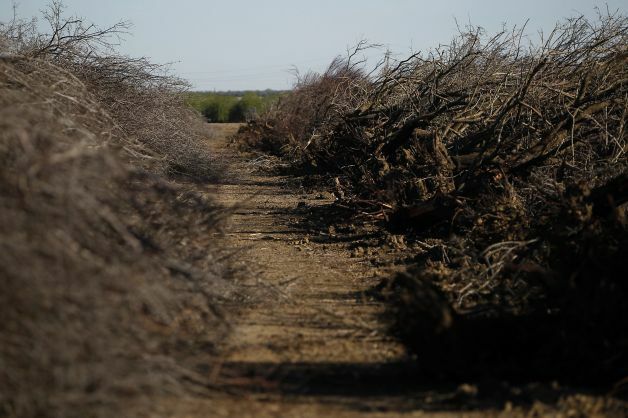 The Drought will cost at least $2.2 billion in agricultural losses this year. Fields of dead almond trees and dried-out crops are a common sight in central California these days. Central Valley towns are also growing desperate. Many have been forced to install porta-potties in their backyards or even steal water from fire hydrants. But even if everyone knows about how dangerous a drought can be, and despite the tremendous efforts for saving water, most Californians are still not aware of the magnitude of the problem. Many believe that the drought can’t be that bad if water still comes out of everyone’s tap, right? 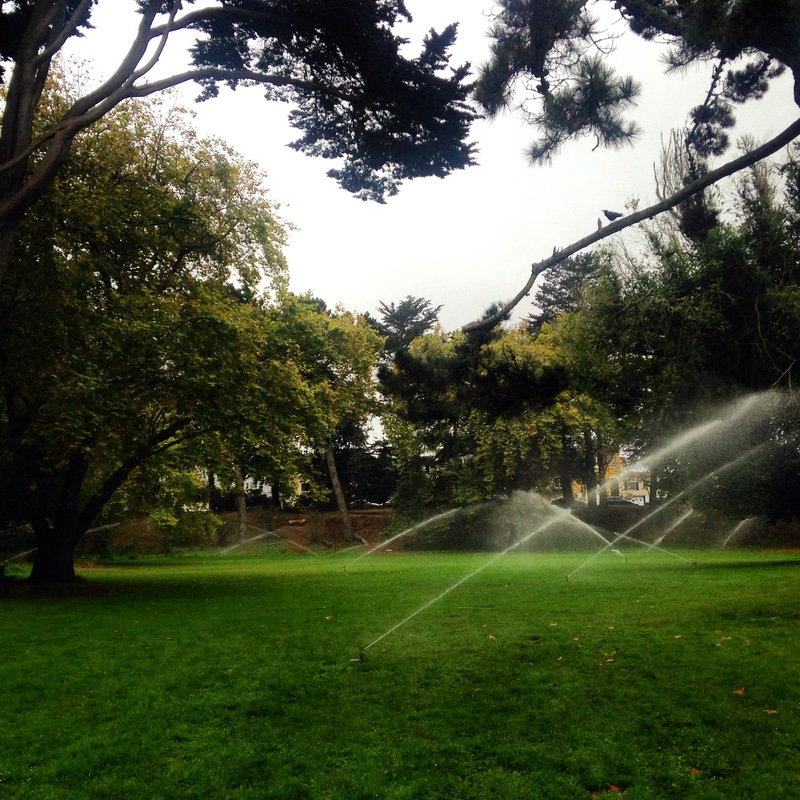 San Francisco’s Golden Gate Park enjoys a vast sprinkler system necessary to keep it alive. But the park’s green grass is nothing more than a mirage. We are borrowing most of this water; either from neighboring states or depleting ground water reservoirs. This will come back to get us. Mark Cowin, director of the California Department of Water Resources, told the Time that our current ground water withdrawal levels are so dangerous that “We are essentially borrowing on tomorrow’s future. We’ll pay that price over time”. A recent study headed by climate scientist Noah Diffenbaugh of Stanford University linked the drought with human-made global warming and climate change. The paper concludes that “extreme atmospheric high pressure in this region-which is strongly linked to unusually low precipitation in California-is much more likely to occur today than prior to the emission of greenhouse gases that began during the Industrial Revolution in the 1800s”. Diffenbaugh and his colleagues used computer simulations and statistical analysis to show that “a persistent region of high atmospheric pressure over the Pacific Ocean–one that diverted storms away from California–was much more likely to form in the presence of modern greenhouse gas concentrations”. Mega-droughts are what Cornell University scientist Toby Ault calls the “great white sharks of climate: powerful, dangerous and hard to detect before it’s too late. 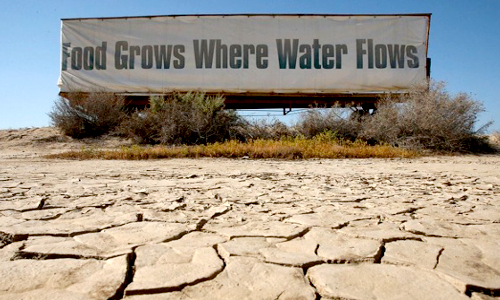 Ault call mega-droughts “a threat to civilization”. University of Arizona climate scientist Gregg Garfin said that “If California suffered something like a multi-decade drought, the best-case scenario would be some combination of conservation, technological improvements (such as desalinization plants), multi-state cooperation on the drought, economic-based water transfers from agriculture to urban areas and other things like that to get humans through the drought”. Ault said that “For the Southwestern U.S., I’m not optimistic about avoiding real mega-droughts. As we add greenhouse gases into the atmosphere -and we haven’t put the brakes on stopping this – we are weighting the dice for mega-drought conditions”. Ault said that mega-droughts could possibly be the worst threat to a civilization, even worse than anything experienced by any humans who have lived in that part of the world for the last few thousand years. 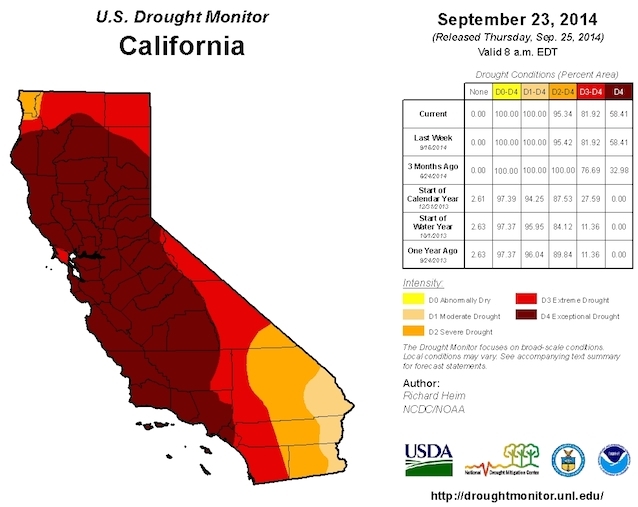 If we continue on this path, California might be headed for a drought-induced collapse. What can the state of California do to prepare? First, we must reduce our carbon emissions and try to reverse climate change. And while water conservation is important, it won’t be enough. We must invest in new technologies like water desalinization plants. It’s the only way to prepare for what’s likely to come. The county’s largest water desalination plant is being built in San Diego. It’s expected to provide clean water to its residents by 2016. Some argue that the plant’s $1 billion price tag is to high, and that its technology is not advanced enough to be cost efficient. But there are many companies out there perfecting water desalination technologies, and one that stands out is WaterFX. WaterFX states in their website that “Unlike conventional desalination, which uses a high-pressure reverse osmosis that forces salt and other solids through a membrane, WaterFX cleans water with a special Concentrated Solar Still. Solar thermal energy is used to evaporate and distill water at 30 times the efficiency of natural evaporation”. WaterFX’s test facility is successfully producing up to 14,000 gallons of fresh water a day. Plans are now under way to expand the demonstration project, which will push up its capacity to 65,000 gallons a day over the same 6,500 sq ft area. Mandell insists that the technology promises to become more price-competitive as production increases. “If 70% of your cost is fuel production for traditional desalination and you want to scale up, the cost goes up significantly, unlike solar desalination,” he says. With no rain, depleted reservoirs and dried up ground water wells, the only place left for California to look for water is the ocean. Dangerous food additives are increasingly sneaking into our favorite foods. We must automatically look at the ingredient lists of our everyday products and understand what they all mean. In most countries food preservatives are still coded (E-number) and people have no clue of what they are eating. If any of the following 10 nasty preservatives shows up in the ingredient list of a product you regularly consume, leave it on the supermarket shelf and look for a safer alternative. Used to stabilize food color and add artificial flavor. 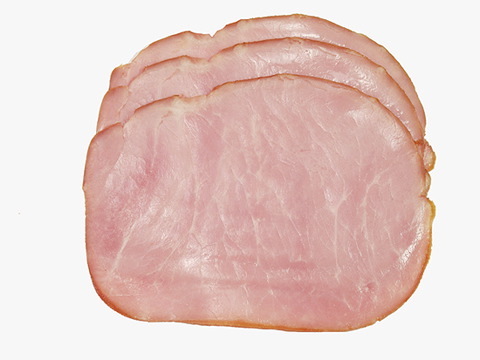 It is found in many products such as meats, ham, bacon, sausages, hamburgers, smoked fish, etc. When grilled it’s even more dangerous -it transforms into a reactive compound that has been directly linked to cancer. A very common flavor enhancer used in a wide range of foods. It adds a meaty salty flavor to many processed foods and is commonly used in meats, soups, sauces, dressings, potato chips, frozen foods, etc. It has been linked to brain damage, asthma, headaches, stomach disorders, fatigue, depression, and obesity among others health problems. Artificial sweetener found in “diet” products, low-calorie desserts, gelatin, drinks, etc. Also known as Nutrasweet or Equal in the U.S.
Studies have shown that lifelong consumption may increase risk of cancer or other neurological problems. 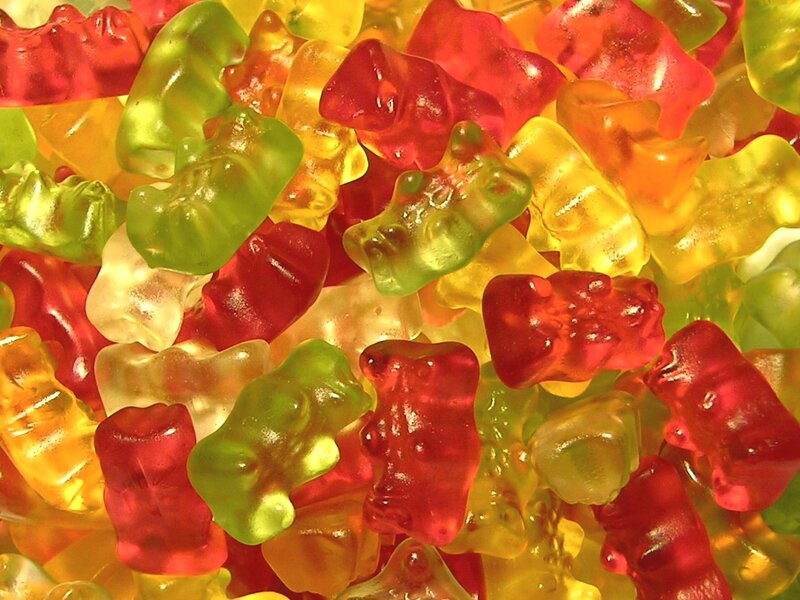 These colorings are found in thousands of products, and they have all been linked to cancer. Some examples of Blue 1 and 2 are found in beverages, baked goods, candy etc and it has been found to cause cancer in mice. Red 2 and 3 are widely used, some examples are to dye cherries, fruit juice, candy, baked goods and have been linked to thyroid tumors. And the widely used yellow 6 (eg.beverages, gelatin, breads, baked goods,sausage, candy, etc) has been linked to tumors of the adrenal grand and the kidney. It’s very common in industrial breads, white flour, and rolls to add volume to baked goods. Most bromate breaks down into a harmless form, however, small amounts can create a risk for people. California now requires a cancer warning on products with this ingredient. It prevents fats and oils from going bad and it’s found in many products, such as meats, soups, gums, etc. It has been linked to cancer and you should avoid it. Butylated Hydoxyanisole (BHA) and Butylated Hydozyttoluene (BHT) are used to prevent foods from oxidizing and keeping fats and oils from going rancid. They are found in countless products such as dry cereals, potato chips, vegetable oils, etc. They have been linked to cancer in numerous studies. Olestra is Procter & Gamble’s synthetic fat that is not absorbed as it passes through the digestive system, so it has no calories. It’s found in chips and diet foods/beverages. Olestra can cause diarrhea, loose stools, abdominal cramps, flatulence, and other adverse effects. Those symptoms are sometimes severe. Even more importantly, olestra reduces the body’s ability to absorb fat-soluble carotenoids from fruits and vegetables. Found in baked goods, chewing gum, and gelatin desserts. It’s a new additive and there aren’t many studies to confirm its safety, if possible try to avoid it. Found in margarine, crackers, fried restaurant foods, baked goods, icing, microwave popcorn, etc. Vegetable oil (liquid), can be made into a semi-solid form by reacting it with hydrogen. Partial hydrogenation reduces the levels of polyunsaturated oils – and also creates trans fats, which promote heart disease. Harvard School of Public Health has issued a warning regarding the consumption of margarine, snack foods and other foods containing hydrogenated oils. If you don’t eat butter, there are some alternatives to hydrogenated margarine, my favorite is Earth Balance. Connecticut recently made history by being the first state to pass a bill that will require the labeling of foods containing genetically modified organisms. Just today Maine followed, and Massachusetts might be next. The Massachusetts Joint Committee on Public Health listened with great interest what over sixty scientists and consumer advocates had to say yesterday, June 12th, in the Boston State House. The H2037 “right to know” bill would require foods that contain genetically modified organisms to be labeled as such. No warnings or negative connotations, just a simple label that would inform the consumer of the presence of GMOs. All EU countries, China, Japan, Brazil and Russia already require GMO foods to be labeled. But opponents of the bill state that there is no need for labeling because “genetically engineered foods are virtually the same as non GMOs, and it would only cause unfair rejection and confusion”. But if something is so different from nature that it needs a patent, why not also label it? Even though the FDA states that GMOs are safe for human consumption, there are still a lot of unknowns. We are still figuring out the effects of genetically engineered organisms on human health. The two major concerns about genetically modified foods are the strong correlation between GMOs and food allergies, and the high levels of glyphosate found in them. Helen Wright explained how she and her children had a severe allergic reaction to a soy based food containing no nuts, even though they are only allergic to peanuts. With GMOs consumers can never be certain if the tomato they purchased has a fish gene in it, or the soy based veggie burger a peanut gene lurking inside. Also, over 90% of GMO crops have been engineered to be Roundup ready (glyphosate resistant) so heavy amounts of this well-known toxic herbicide is sprayed constantly over them. Scientists showed the committee results linking glyphosate with autism, obesity, depression, endocrine disruption, and Alzheimer if consumed over a long period of time. I’m confident that our representatives will agree that we have the right to know. If you want to learn more about this bill and the efforts behind the GMO labeling campaign go to MArighttoknow.org. Al Gore gave an inspiring talk last night at Harvard University titled “Healthy Planet, Healthy People” in honor of the late Dr. Paul R. Epstein, the brilliant scientist who shared the Nobel Peace prize with him in 2007. Gore started the night by acknowledging Dr. Epstein’s work in connecting the dots between climate change and its impact on global human health. Warming temperatures will allow disease carrying mosquitoes to spread out of the tropics, bringing malaria, dengue fever, and other currently tropical diseases to higher latitudes. “Global warming will also prolong mosquitoes reproductive and life cycles, and enable deadly viruses to survive in places that were too hostile for them before” Gore explained. 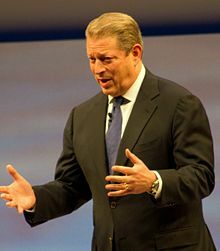 Gore also mentioned the connection between the uprising of diseases like cholera and global warming. “Communities have learned to deal with cholera by investing in infrastructure and building better sewer systems. The last thing they would have done is turn their streets into an open sewer. But that is exactly what we are doing to our atmosphere. We are using it as an open dumping ground, dumping over 35 billion metric tones of carbon per year”. Gore quoted James Hansen, head of the NASA Goddard Institute to illustrate the severity of the situation “the amount of extra heat being trapped in our atmosphere is like exploding 400,000 Hiroshima atomic bombs per day 365 days per year, that is insane”. The audience broke into laughter when Gore mentioned that “When Inconvenient truth came out I repeatedly heard from my detractors that I was exaggerating when I talked about water flooding the World Trade Center memorial site. After Sandy, I don’t get that anymore”. Gore explained how democracy and capitalism, the two pillars supporting the weight of our society have been degraded over time and turned into a corrupted and intertwined mess. “Our democracy has been hacked, our operating system has been turned into something very different our founders intended. What our founders gave us was amazing, and I’ve watched it degrade over time.” Gore said. Even if corruption is evident, Gore remains optimistic in our democratic system. “I am hopeful because of the internet. Not today, not tomorrow but soon the internet will replace TV and people will have an open space for debate and conversation, internet is the public square for democracy”. Gore also explained that our economic system needs to be redefined. One of the main problems our current system faces is our definition of growth. “The definition we are using for growth is literally insane” Gore said. Gore argued that GDP, the main tool for measuring a country’s economy is terribly flawed. Simon Kuznets, the economist who first developed GDP in 1934 warned that it should not be used to measure a country’s wealth. But of course, nobody listened. Since GDP was implemented in 1937, almost 95% of the US income goes to the top 1% of the country. Gore, like Kuznets and many others believe that GDP fails to take into account major aspects of a country’s economy, such as externalities, depreciation of resources, positive externalities or distribution of income. Costs related to pollution or environmental degradation are not accounted for (externalities), and contributions to science, mental health or arts (positive externalities) are also ignored in this economic model. “Our GDP tells us, hey we are doing great, the US is just fine, but in reality we are not. Only the top 1% is doing well. We must be more accurate, or this economic model will drive us over the edge of the cliff.” Gore said. But despite all this, Al Gore remains hopeful. “I am optimistic because President Obama in his acceptance speech addressed Global warming in an urgent manner, more than any other president before him. Obama now has no choice but to address global warming and act. And I know he welcomes this challenge”. Al Gore is hopeful that renewable energies will pick up soon as the cost reduction and increased implementation will make them more accessible. He also recommends putting a price on carbon and regulating CO2 emissions from power plants. Gore ended his talk praising young people’s passion and desire for change. “Young people that don’t succumb to the temptation of being cynical, and are passionate about what they do is what gives me hope for the future”. 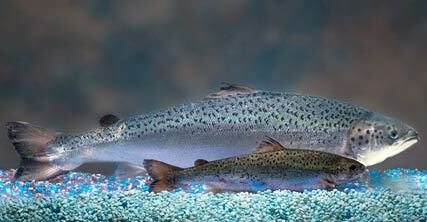 The AquaAdvantage salmon has been developed by AquaBounty a biotech company based in Waltham, Massachusetts. Their GM salmons have an added growth hormone from the Pacific Chinook salmon and a promoter gene from an ocean pout that allows the fish to produce growth hormone all year long instead of only during the Spring and Summer months. The fish grows to market size in 16 to 18 months rather than three years. Aquabounty has reassured this salmon is safe for consumption and poses no threat to the environment as they intend to only develop sterile females. Environmental and advocacy organizations such as Greenpeace, Friends of the Earth or Food and Water Watch oppose what they call the “Frankenfish”. They are concerned that it could cause human allergies and the eventual contamination or decimation of the natural salmon population if it escapes and breeds in the wild. The Monterey Aquarium revealed that current methods used to produce sterile fish are less than 99% accurate. That would mean that one fish in every hundred would not be sterile and could be reproductively viable. Another concern is that production of GE salmon, even in its early stages, is likely to involve the production, shipping and growing of hundreds of thousands of eggs and fish which could also be accidentally released into the wild. According to its opponents, the escape of reproductively viable GE salmon into the wild is very likely to occur. If this were to happen, the consequences are very hard to predict. Another unsettling aspect of the commercialization of the modified salmon is that consumers would not necessarily know how to distinguish it from regular farm raised salmon. Labeling of GM foods is not required by federal law, so consumers would not know how to spot the modified salmon in their grocery stores or restaurant menu. If the AquaAdvantage salmon is finally approved, it would be the first genetically modified animal approved for food consumption anywhere in the world. The FDA has opened its report for public comment and will review the situation before making a final decision. The consultation will finalize at the end of February 2013, so now its the time for the public to state any concerns here. In a recent forum held at the Harvard School of Public Health four expert panelists discussed the most important lessons learned from Hurricane Sandy. This storm has brought the conversation of our vulnerability and need for adaptation to climate change back to the table. Schrag explained that even if Sandy was thought to be an unusual event, storms like this one will become more frequent due to global warming and climate change. “Sandy got stronger as it moved from the Carolinas up to New Jersey, when it should have been the opposite”. Normally storms weaken when they move north. Water at that time of year is usually pretty cold and storms should disperse when coming into contact with the chilly waters. But the water temperature off the coast of New Jersey on October 29th was 4C warmer than normal. This pool of warm water gave the storm and extra kick bringing it from 75 mph to 90mph. The panel also explained that super storms like Sandy might hit the Northeastern US more frequently that before due to increased melting of the Greenland ice caps. The hurricane took a left turn at the Jersey shore, which is quite rare. Less than 10% of storms move from east to west, normally they would head north and move eastwardly out to the sea. The hypothesis is that the retreat of Arctic sea ice and melting of Greenland are in fact steering storms towards the Northeastern coast of the US. “If this proves to be the case, if we really are starting to steer storms towards the East coast, that’s a much bigger deal than any kind of intensification. We have a lot of storms per year, so this could be really bad.” Schrag said. Jerold Hayden, professor of Urban Planning at Harvard University agreed with Schrag that after natural disasters “we rebuild, but we don’t necessarily rebuild better”. We need to start spending money today if we want to prepare for the next storms and sea level rise of the future, and we need to tell people not to develop where they where developing before. The panel agreed that “immediate post Sandy is an incredible opportunity in terms of thinking of what kind of investments to make in order to make our systems more robust.” Many of these measures can be simple and localized. Rising power supplies to higher floors, or adding pumps in place so that we can pump out water from flooded areas in a day or two after a storm are local ways to achieve more resilience. Schrag warned to those relying too much on technology and predictions that “however good our models are in predicting storms, I promise there will be surprises. No matter how well prepare, there are going to be brakes”. Sandy is just the beginning of a new climate era. Extreme weather is going to be the new normal, and we must adapt to this new reality if we don’t want to end up with water up our necks. 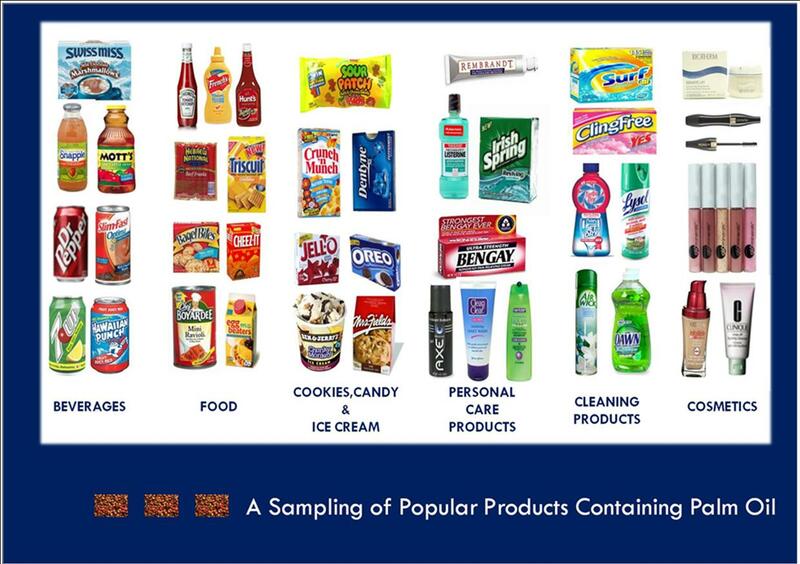 If we open our fridge, bathroom cabinet or laundry room, and take a close look at the products we keep in there, we have a very high chance of finding palm oil in at least half of them. In most ingredient lists, palm oil often hides behind the “vegetable oil” pseudonym, which makes it hard to identify. Palm oil has taken over most of our every day products. It’s in our shampoos and soaps, cleaning agents, in our chocolate, margarine, spreads, soft drinks, baked goods, ice creams, chips and potato fries, and even in our powder milk. OK, so what is so bad about Palm oil? The problem is that it comes with a side of deforestation. In a previous article linking palm oil and deforestation, I explained how huge palm oil mono-cultures are rapidly substituting Indonesia’s old growth forests, pushing some of the last Orangutans, and countless of other species to the brink of extinction. Deforestation is also placing Indonesia as one of the top CO2 emitters in the world -not from burning fossil fuels, but from the massive CO2 levels released from deforestation-. The last orangutan populations in the world are found in Indonesia and Malaysia, the two largest producers of palm oil in the world. Over 80% of the palm oil produced in the world comes from Indonesia, and the vast majority has been produced at the expense of some of some of the last old growth tropical rain forest in the world. Despite this gloomy future, our thirst for vegetable oil is just going to increase. But maybe we can feed it with a different and more sustainable type of oil. And here is where Solazyme, a San Francisco based biotech company comes into play. Solazyme produces high quality algae oil that is not only much more sustainable but also healthier than palm oil. In March of 2010, Solazyme entered into a research and development agreement with Unilever, the world’s largest consumer of palm oil, to develop oil derived from algae for use in soaps and other personal care products. The agreement followed the culmination of a yearlong collaboration between Solazyme and Unilever, in which Solazyme’s renewable algal oils were tested successfully in Unilever product formulations. What is more, Solazyme algae based oils have been proven to offer superior health benefits when used as substitutes for vegetable oils in food products. These benefits include reduced calories, saturated fat and cholesterol, and functional benefits such as enhanced taste and texture for low-fat formulations, while also providing lower cost handling and processing requirements. Many experts regrettably say that orangutans and Sumatran tigers are walking extinctions. But if companies like Solazyme are able to turn sustainability into profit, they might still have a chance.